The eight-pack abs that he has so laboriously built aren’t just showpieces to be flaunted through ripped shirt. Behind those abs, muscles, biceps and triceps, lies the primal force of a man determined to make a point. 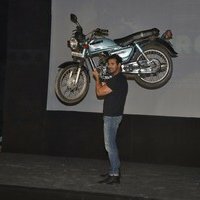 Ever since the news of John Abraham having lifted a bike in his new movie Force came out, sceptics have been raising their bushy brows over the boast. It was believed that the stunt was shot using cables that bore most of the bike’s weight. But at the promotion event of Force held recently, Johnny boy silenced his critics and put all doubts to dust by actually lifting a bike in front of everybody. The mediapersons were left with their jaws dropped as John heaved the 115 kg bike on his shoulder. There were even hushed whispers that it’s a stunt that other action heroes like Salman Khan and Ajay Devgan can’t replicate.